You long-time readers probably already know that I’m nuts about Mountain Rose Herbs. Ever since I reviewed their Himalyan Pink Salt, this company has had a vise-like grip on my heart and wallet. I’ve now tried an embarrassingly wide array of their teas (all of which I love), but today I wanted to review two of their organic tinctures. You get a tincture when you put an herb, or a blend of herbs, in a strong alcoholic solution and let it sit for at least 2-3 weeks, shaking the jar occasionally. Tinctures are a wonderful way to administer the healing aspects of plants and herbs because they pull the best essence from the plant, and they last for years. Tinctures can be taken straight, or added to tea and water for consumption. Since my love affair with herbal medicine began, I’ve been learning as much as I can about different herbs and how they can help us live healthier lives. The biggest benefit to taking tinctures is preventative medicine. That is, you’re making efforts to get and stay healthy before you get sick. So why take a tincture instead of, say, a pill? Well, when herbs are put into pill form they must be dried, then chopped up into a fine powder. This excessive handling destroys much of the medicinal benefits that were there in the first place. Because tinctures use soaked herbs, more of the essential plant essences are retained. Translation: we get more of the good stuff with tinctures. Tinctures are also easily assimilated into your body. Pills must be digested. 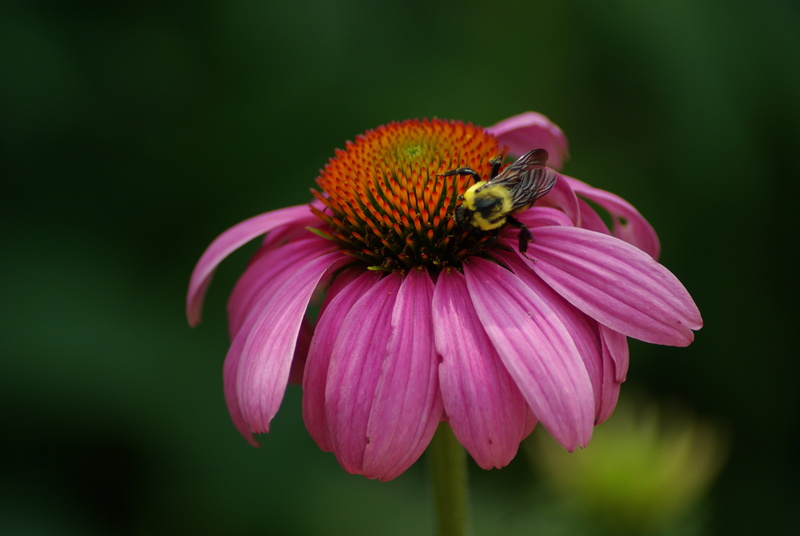 Most of you have probably heard of echinacea. This wonderful, well-known herb has been used for thousands of years to strengthen the immune system and treat colds. 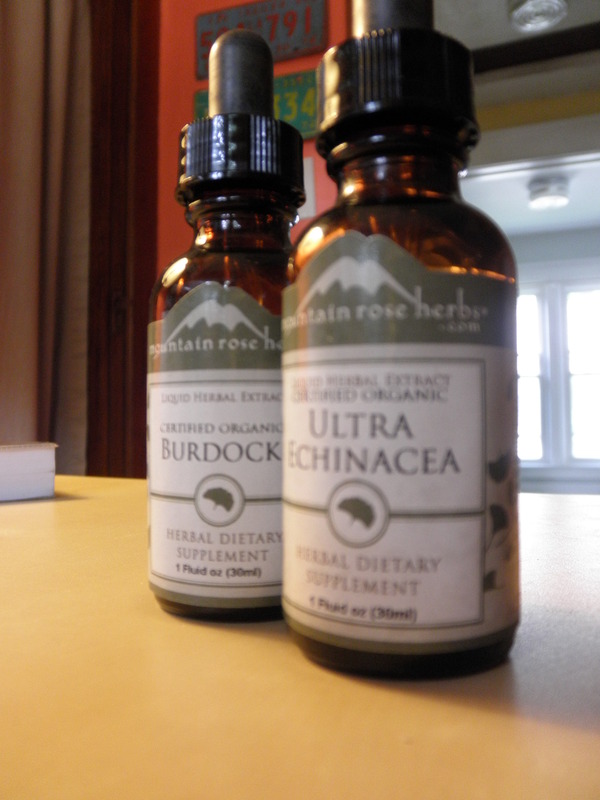 I’m using the echinacea tincture daily to help strengthen my own immune system. Well, I’ve been taking mine straight. And it’s really, really bitter. But, that can be a good thing. Bitter flavors are actually really good for your digestive system, and truth be told I’ve actually gotten used to the flavor. I simply squirt one dropper-full on the back of my tongue. It kind of gives it a brief “numb feeling”. I have not gotten sick, not even a sniffle, since I started taking this tincture. You can buy a 1 oz. jar from Mountain Rose Herbs for $8.75. 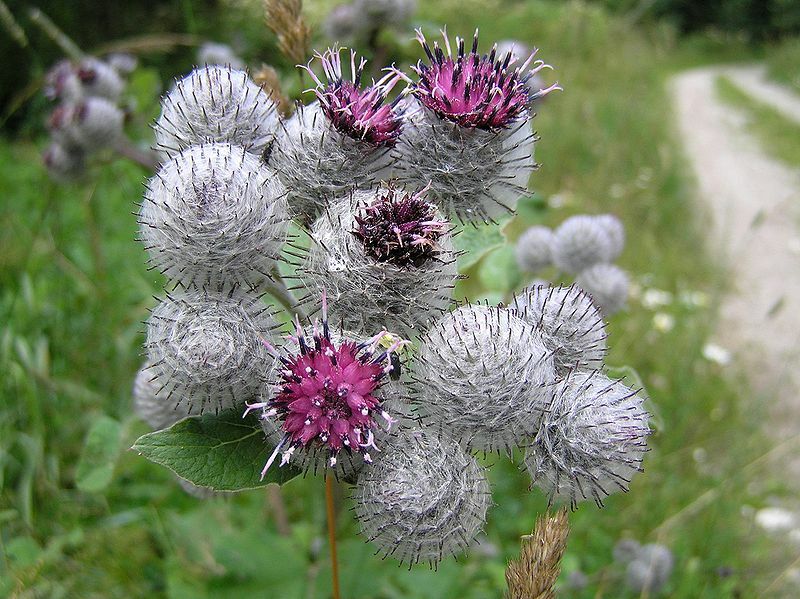 Burdock is a lesser known herb that’s common in North America. There is considerable evidence in the scientific literature that burdock root tea is a powerful anti-inflammatory remedy. Its numerous antioxidants protect the liver from toxic chemicals, allowing it to process the body’s naturally occurring steroids which are helpful in achieving hormonal balance. A mildly bitter herb, it stimulates the release of gastric juices and aids digestion. This combination of qualities explains its traditional use in treating acne, eczema, endometriosis, psoriasis, and uterine fibroids. The tea can also be used as a wash to treat skin infections, eczema, and psoriasis. This is another bitter herb. But just like the echinacea, I’ve found I’ve gotten used to it since I started taking it. I’m taking burdock because I read that it can help kidney stones. I have a whole bunch of stones just kind of “floating around” my kidneys. When they start moving around, it’s not fun. I thought burdock might be useful for naturally breaking them up. But it’s also one of those classic herbs that does so much good that everyone should take it. When my burdock runs out, I will be ordering more. Tip: Keep in mind that treating yourself with herbal medicine is a long-term health strategy. You’re not going to take one dropper of an herb tincture and feel better. Herbs do you the most good over a span of months, not days or weeks. I’m a big believer in preventative medicine, and I think it’s the best thing you can do for your health because it just makes sense. As a self-employed freelance writer, you can only imagine what my health insurance is like. Think “for emergency only” and you’ll get the idea. I go to the doctor only it’s a very serious emergency because my insurance just doesn’t cover office visits. Or prescriptions. And since I work for myself, I also don’t get paid sick days (what a luxury!). This means it’s up to me to not get sick. The more I learn about herbal medicine the more I realize that Mother Nature has given us everything we need to stay healthy. I’d far rather spend $20-$30 on herbal tinctures to keep my immune system strong than get sick and lose a day or two of work. Financially, that’s just a smart investment. I also believe that, when taken correctly, herbal tinctures are much safer and easier on our bodies than commercial medicines, often which contain chemicals we can’t even pronounce. So, you can bet I’m going to continue to use these tinctures, especially the echinacea and other immune-supporting herbs. The quality of Mountain Rose Herbs is incredible, and it’s all organic. Great post. I agree that nature has given us all we need to stay healthy. Separated from nature by asphalt and concrete and car exhaust, it’s no wonder people often get sick and eventually get cancer. Use caution when taking tinctures due to their potency. I prefer powders or pills at the moment. As most people have a family/primary care doctor, I also recommend having a primary herbalist who can advise on herbs available at Whole Foods and elsewhere, and mix personalized combinations.